Language identification is an elemental task in natural language processing, where corpus-based methods reign the state-of-the-art results in multi-lingual setups. However, there is a need to extend this application to other scenarios with scarce data and multiple classes to face, analyzing which of the most well-known methods is the best fit. In this way, Peru offers a great challenge as a multi-cultural and linguistic country. 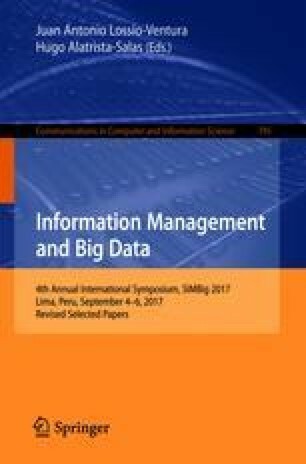 Therefore, this study focuses in three steps: (1) to build from scratch a digital annotated corpus for 49 Peruvian indigenous languages and dialects, (2) to fit both standard and deep learning approaches for language identification, and (3) to statistically compare the results obtained. The standard model outperforms the deep learning one as it was expected, with 95.9% in average precision, and both corpus and model will be advantageous inputs for more complex tasks in the future. The authors are thankful to J. Rubén Ruiz, bilingual education professor at NOPOKI, for providing access to some private books written in indigenous languages [5, 22]. Likewise, it is appreciated the collaboration of Dr. Roberto Zariquiey, linguistic professor at PUCP, for allowing the use of his own corpus for the Panoan family . Furthermore, it is acknowledged the support of the “Concejo Nacional de Ciencia, Tecnología e Innovación Tecnológica” (CONCYTEC Perú) under the contract 225-2015-FONDECYT.